The 160 elegantly appointed guestrooms and suites at the NH Collection Turin Piazza Carlina are designed with total comfort in mind and feature a relaxing color scheme of cream, old rose, and blue. 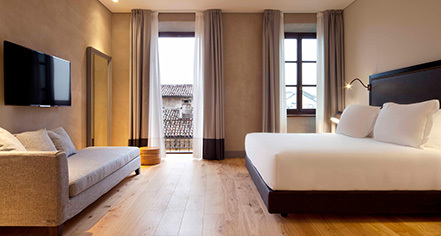 Guestrooms feature hardwood floors, furniture made by local craftsmen, and many rooms feature views over the Piazza Carlo Emanuele II and the Mole Antonelliana. 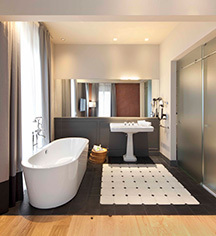 All rooms have a parquet and soundproof double glass windows. For comfort, the beds have high quality mattresses to promote a restful sleep and guests can choose among three different types of pillows, differing in size and softness. Guest can unwind with a movie or keep up with breaking news on the 46-inch flat screen television, featuring national and international channels, or stay connected with complimentary WiFi. All 160 guestrooms and suites have a kettle and a coffee machine so guest can enjoy a cup of herbal tea, a coffee, or complimentary bottled water before starting the day. Room service is available 24-hours a day..